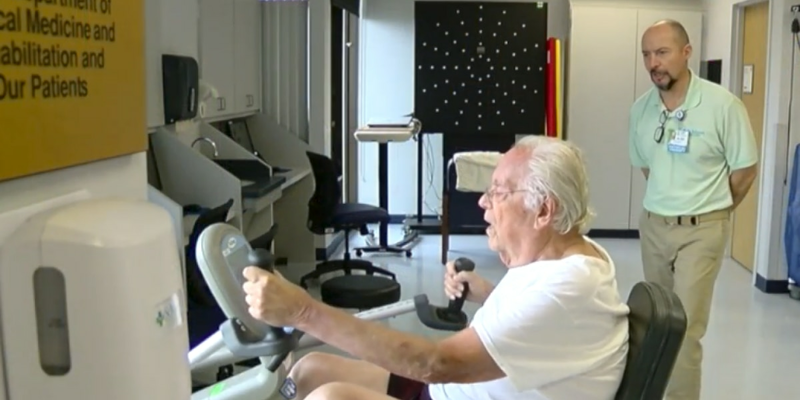 WEST PALM BEACH, Fla. — Richard Birnberg, a retired doctor, has physical therapy five times a week. The 85-year-old suffered a stroke last month. "I was walking my pouch who happens to be a rescue dog from Puerto Rico, and I was at one of her favorite spots and all of a sudden I felt like I'm just going down," Birnberg. Now he's on the road to recovery at The Brain Injury Specialty Care Center at St. Mary's Medical Center. The center, which was just unveiled, will offer extensive care for patients with traumatic brain injuries, according to Dr. Bella Chokshi. "We have a three-hour daily therapy program, where you have certified therapists, physical, occupational speech therapies. we have neuropsychology, recreational therapy, dietitian and respiratory needs for these patients." The center can house 8 patients at a time. And as patients are being cared for, Dr. Chokshi says family members will receive hands-on training on how to look after their loved one once they go home. "We get a lot of patients on all sorts of spectrum of brain injuries. Some patients have special needs like tracheostomy and tube feeds for their nourishment and to maintain their quality of life." As for Richard, he says he's recovering well. "I look like a million bucks, right." The Brain Injury Specialty Care Center at St. Mary’s Medical Center is located at 901 45th Street in West Palm Beach.